– vide F. Hutchinson & F. Myers, The Australian Contingent, Government Printer, Sydney, 1885, p. 3. The badges of the New South Wales Military Historical Society are the military embodiment of the badge of the Colony of New South Wales. The emblem featured on the front cover of the Society’s Journal since January 1967 being the helmet plate of the New South Wales Military Forces. The usage of the badges of the state continues with the State Regiment in New South Wales being the Royal New South Wales Regiment. This work shows the introduction of the badge of New South Wales. A recent book by Grebert entitled Military Badges of the Australian Colonies 1800-1903 (1) shows many photographs of badges worn by the New South Wales Military Forces. Unfortunately official records concerning these badges are non existent and the work contributes a valuable compilation of material available. 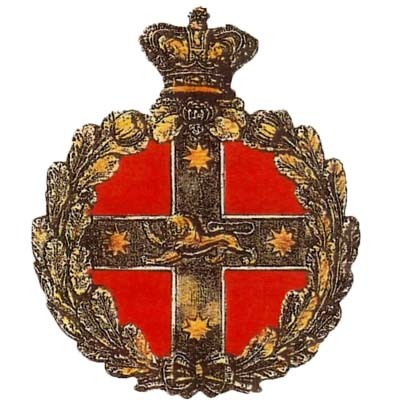 The badge of the Colony, and later the State of New South Wales consisting of a lion upon the cross of St George, with a star at each arm of the cross was granted on 4 July 1876.Thc badge was designed by James Barnet, the Colonial Architect, and Captain Francis Hixson R .N. commanding the Naval Brigade, later commanding the Naval Forces and President of the Marine Board (2). Adoption of the badge by the military forces did not follow immediately. The badge eventually formed the centre of a variety of badges adopted by the military forces, often being surrounded by a wreath with waratahs and surmounted by a Victorian crown. In its largest form it became the helmet plate of the NSW Forces, which was adopted in 1883 (3). A second notice two weeks later specified that a scarlet backing be worn (4) and the practice remained until Federation when use of the plate was discontinued. The helmet plate is 103mm high. The helmet was issued with a gilt finish and bronze for the permanent forces and in white metal for volunteers and partially paid forces. Modifications of the badge were used on other items of dress including head-dress, bolts, pouches, sword hand guards, buttons and horse furniture. Dress Regulations for Officers issued dated 30 August 1881 ( 5 ) include a number of references to the badge of the Colony. The regulations applicable to the General Staff included the telescope-case with the badge of the Colony surmounted with a crown and the plate Gilt, rectangular burnished, with the badge of the Colony in silver. The Volunteer Staff have the same badges, but in silver. The Permanent and Volunteer Artillery on the pouch, to have respectively an embroided gold or silver emblem with the badge of the Colony within a wreath. The Engineer and Torpedo Corps to have on the flap of the telescopic-case, the badge of the Colony in silver. The Medical Staff wore a pouch for instruments, with on the centre of the flap, the badge of the Colony in silver. The helmet and buttons were simply indicated as per scaled patterns which are not available.The introduction of the badge of the Colony is readily pinpointed as several other sets of dress regulations were introduced just before the regulations of August 1881. Dress Regulations for Officers were issued in 1879 (6), similarly Dress Regulations for N.C.O.’s and men were issued in the same year (7) and in 1880 (8) and 1881(9) to be effective at the beginning of 1882 while Additions to Dress Regulations for Officers issued in April 1882 (10) are available and none of these make any reference to the badge of the Colony.Dress regulations for Mess Jackets and Waistcoats for all branches of the services were issued in 1884 (I 1) included use of buttons with the badge of the Colony i.e. universal pattern. Field Service Dress was authorised in 1890 (12-13) and the hat of the General and Permanent Staff and Mounted Infantry employed the badge of the Colony.Many badges with the badge of the Colony within a wreath and a flattened Edwardian crown arc in existence, no Dress Regulations have been observed that detail use of these badges. Possibly they were issued after the death of Queen Victoria.A helmet plate bearing a typical Edwardian crown exists as docs a smaller head dress badge. Regulations for the wearing of these badges arc also unknown. 2. Badge of the State of New South Wales. T.H Tennant. NSW Government Printer 1945- 1947. Undated.